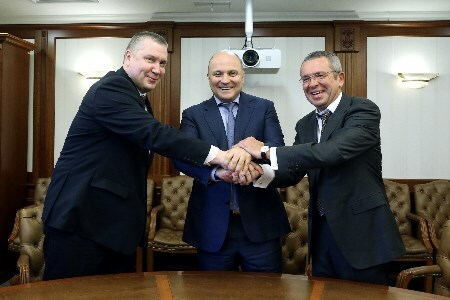 Two scientific and technical co-operation programmes for the period 2016 through 2021 were signed on 23 November at the Gazprom headquarters, with one programme inked by Gazprom, Magnitogorsk Iron & Steel Works, and TMK, and the other by Gazprom, Magnitogorsk Iron & Steel Works, and Chelyabinsk Pipe Rolling Plant. The programmes are aimed to supply Gazprom with innovative, highly reliable pipe products and to enhance the economic efficiency of the construction and operation of natural gas production, transmission and processing facilities. Under the programmes, it is planned to set up the production of flat products and pipes using high strength steel up to K90 (X120); steel with enhanced resistance to CO2 environments and stress corrosion; and steel that makes pipelines tolerant to a wide temperature range. The programmes also stipulate the development of new construction materials, including for gas liquefaction and underwater production projects. In addition, the documents are intended to create information systems with the purpose of helping monitor the technical condition of pipes during the production stage and throughout the entire lifecycle of pipelines and to optimise construction and operation processes. According to the programmes, Gazprom will provide organisational and consulting support, while Magnitogorsk Iron & Steel Works, TMK, and Chelyabinsk Pipe Rolling Plant will perform relevant R&D and engineering activities.